﻿ Zebra Mirror on the Wall…Who’s The Fairest of Them All? Animal Print Essentials › General › Zebra Mirror on the Wall…Who’s The Fairest of Them All? Zebra Mirror on the Wall…Who’s The Fairest of Them All? I am so thrilled to learn that Vanguard Furniture just introduced a new line of Upholstered mirrors for this season! Upholstered mirrors can be offered in different sizes and shapes, with the fabric or leather of your choice, and a selection of nail trim finishes. Above we see a square clover mirror in Zebra print, with Zebrino Onyx Leather and Standard #9 Nail application in Platinum finish. Available sizes are round, square, oval or rectangular. For more information on the mirrors and upholstery samples, please contact us. So Glad that you like our new mirrors! As a leader in the home furnishing industry, we are always trying to find new ways to develop innovative and personalized products for our customers. In addition, we continue to find new ways to keep our associates gainfully employed by building new products that capture new marketshare! Every room has 4 walls, so the opportuniities for a personalized upholstered mirror is endless. I am sorry, I missed your question, usually inquiries go through our e-mail. 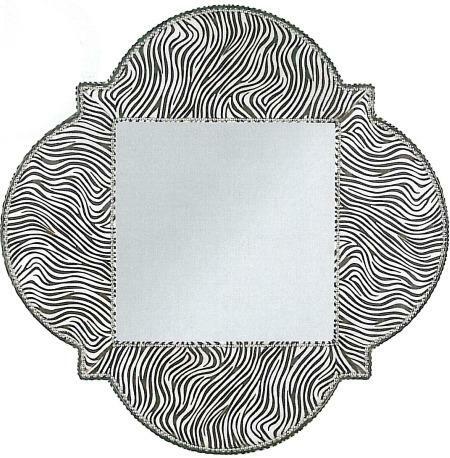 Any way, the Zebra mirror’s price is $1,188 with the pony hide zebra print. It comes in two different colors, black/white and beige/chocolate. If you need to consider shipping charges, I will need to know where you are located. Usually there is not tax charge. You can upholster this mirror with any grade leather or fabric you desire and the price will be accordingly. If you need more detailed photo of the zebra, please e-mail me at info@animalprintessentials.com and I will follow up asap. I hope this answers your question. I like this mirror. It isn’t your usual rectangular shape. How much is it? Hi Jeanette, Thank you for visiting Animal Print Essentials. I will have to check it out and I will get back to you asap.